Christine has played a leadership role at InterExchange, and within the international cultural exchange community, for more than 25 years. She started her InterExchange career with the Au Pair USA program, from 1992 to 1997, and since 2000 has held management and executive roles in the organization. Christine serves on the Board of Directors of the Alliance for International Exchange (her second term) and is proud to represent the cultural exchange community and U.S. Department of State J-1 Exchange Visitor Programs at U.S. Embassies and Consular Sections around the world. Prior to InterExchange, Christine worked in arts administration and retail management. She holds a B.A. in French Culture and European History from the University of New York at Albany, spent a semester abroad in Paris, and was a Rotary International Youth Exchange Student to the Republic of South Africa. Christine is a supporter of many international and domestic causes ranging from women’s rights, ending animal cruelty, and providing opportunities for disadvantaged teens. After growing up in a small town, she appreciates the diversity of New York City and proximity to JFK’s international departure terminals. She enjoys cooking and photography in her free time. Nicole has worked in the international exchange field since 1997. Prior to her work with InterExchange, Nicole lived, worked, and studied in India and Japan. She holds an M.B.A. in Management from the Zicklin School of Business at CUNY Baruch College and a B.A. in History from Oberlin College. Nicole loves travel, and is an avid reader and public radio supporter. When not facilitating life-changing cultural exchange opportunities, you can find her seeking out the latest international food New York City has to offer. Lee is a senior-level executive with experience working in established international corporate groups with sales in excess of $70 million annually. He has extensive hands-on experience in management, business leadership, and Board membership. Prior to joining InterExchange, Lee was the Executive Vice President & Chief Financial Officer of Hotel Representative, Inc., the parent company of the Leading Hotels of the World, Ltd, where he had started as Director of Finance in 1993. Lee also served on the Board of Directors of both Hotel Representative, Inc. and The Leading Hotels of the World, Ltd. His previous roles include serving as Director of Finance for Colonial Printing, Inc. and as Assistant Controller for Volvo North American Corporation. He is a Certified Public Accountant and holds an M.B.A. from Farleigh Dickinson University. Lee served in the U.S. Navy and was honorably discharged in 1969. He is married with three daughters. Dirk is an Australian software engineer who moved to the United States in 2011 on a specialist work program. After working in software consulting within education, retail, and medicine, it was the international exchange world that caught his interest. Working with InterExchange since 2013, Dirk’s focus is on bringing consistency and efficiency to the way InterExchange enacts its mission of uniting people through international exchange. Dirk has a Bachelor of Science in Internet Software Development from Murdoch University, has worked for Pivotal Labs and run multiple businesses. As an international cultural exchange professional of nearly twenty years, Casey has collaborated with international agencies, NGOs and various governments to help expand exchange opportunities for youth from around the world. In addition to his work with InterExchange, Casey has been active in international education and exchange organizations including WorldTeach, The Center for International Humanitarian Cooperation, the WYSTC Confederation, WYSE Work Abroad, and the Alliance for International Exchange. Casey holds a B.A. in Political Science from Hobart College and an International Diploma in Humanitarian Assistance from the Center for International Humanitarian Cooperation (CIHC) at Fordham University. In his free time, Casey enjoys travelling and sports. Michael has worked in the international exchange field since 1998. Prior to his work with InterExchange, Michael lived, worked, and studied in England, France, and Japan. He held an elected position on the International Au Pair Association’s executive board for six years. Michael has a B.A. in Communications and Journalism from Shippensburg University of Pennsylvania and the University of Lincolnshire. He has continued his education over the years taking a variety of courses in the fields of international relations, business, operations management, and foreign languages. An avid traveler, Michael recently achieved his goal of traveling to 40 countries in 40 years. Next goal, 50 in 50! Heidi is passionate about international travel and cultural exchange and has dedicated her career to helping young people travel and experience America. Prior to joining InterExchange, Heidi spent 20 years in senior management positions overseeing U.S. Department of State J-1 Exchange Visitor Programs including Au Pair, Summer Work Travel, Intern, Trainee, and High School. Heidi attended St. Mary’s College of California and holds a B.A. in English and French. She spent her junior year studying abroad in Paris, France and has since traveled extensively. Heidi resides in the Bay Area with her husband and six kids. Her family has hosted au pairs from Turkey and Germany and exchange students from Japan. Heidi enjoys cooking, current events, volunteering, and spending time with good friends. After studying abroad in France and teaching English in China, Mark was hooked on cultural exchange. He’s worked in the international exchange field for nearly 15 years. Prior to joining InterExchange in April 2016, Mark served for seven years at the Alliance for International Exchange, advocating for the health and growth of exchange programs. He also worked as the Director of College Communications at Georgetown University and the Program Associate for Communications at Global Ties U.S.
Mark has a B.A. in English from the University of Notre Dame and an M.A. in International Communication from American University’s School of International Service. He’s coauthor with Sherry Mueller of Working World: Careers in International Education, Exchange, and Development (Georgetown University Press, 2014 and 2008). Originally from Cincinnati, Ohio, he enjoys playing squash, volleyball, and guitar, and is involved with mentoring programs for college students interested in international careers. Lynne has been working in international education and cultural exchange since 2003. Originally from West Virginia, Lynne received her B.S.B.A. in International Business and Marketing from Xavier University. In 2003, Lynne moved to NYC to attend New York University, where she earned both an M.A. in Higher Education Administration and an Advanced Certificate in Teaching English to Speakers of Other Languages (TESOL). As a student, she studied business in Torino, Italy and pursued an intensive cross-cultural research project in Puerto Rico during graduate school. 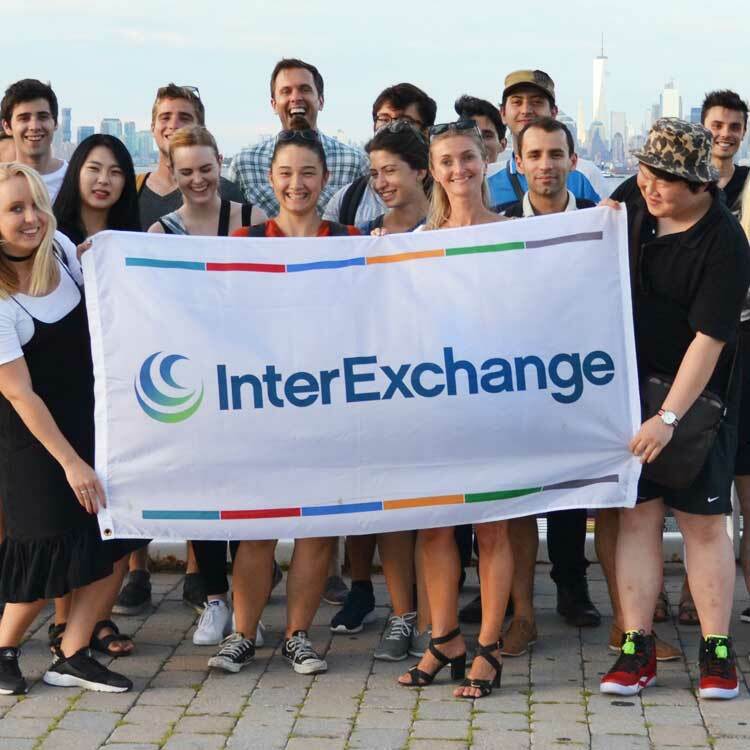 Prior to joining InterExchange in 2008, Lynne worked with various programs and offices at New York University, including NYU Study Abroad, NYU Precollege, the College of Arts and Science Advising Center, and the College Learning Center. In her free time, Lynne can be found perfecting her sailing skills as a crewmember on the South Street Seaport Museum’s historic schooner, Pioneer. James left his hometown near Philadelphia in 1999 to study journalism at Towson University. After several years reporting for a news service in Baltimore post-college, he sought a career change. In 2007 he left the U.S. to lead high school abroad programs in Ladakh, India, between the Tibetan Plateau and the Kashmir Valley. Since then he has led youth volunteer and education programs in Cambodia, Nepal, Costa Rica, and Baltimore. James received an M.S.Ed. from the University of Pennsylvania in 2012 before joining InterExchange, where he oversees our programs for U.S. citizens. Christian has been working in camping and cultural exchange for nearly a decade. He spent several summers working at a residential summer camp before entering the cultural exchange industry. Christian has extensive experience with camp programs and is familiar with both the challenges and rewards of the camp experience for camp directors, staff, and campers alike. He attended the University of Florida and upon graduation, spent a year living abroad in New Zealand. Christian is dedicated to facilitating cultural exchange opportunities and enjoys travelling and spending time with his family. Rachel has worked in Human Resources for more than eight years. She strives to bring a holistic, employee-centric approach to her work. Prior to joining InterExchange in late 2015, Rachel handled HR for Brooklyn Bowl, a well-known NYC live music venue. Prior to that, she worked in wine sales, frequently traveling internationally on purchasing trips. As an undergrad at the University of Maryland, Rachel had her own study abroad experience in the UK that influenced her love of both cultural exchange and wine (she had a part-time job in the village wine bar). These days, most of Rachel's traveling takes place closer to home with her two young children in tow. She is active in several volunteer activities in her local community. Jonathan has worked in finance and accounting for just over 20 years. While new to the cultural exchange community, he is no stranger to the nonprofit sector, having worked in that environment for more than 13 years. Those stops included organizations that operated both globally and domestically. Before joining InterExchange, Jonathan served as Deputy Director of Financial Services for an organization servicing women in need and the homeless. Jonathan is a Certified Public Accountant, and holds a Bachelor’s degree in Accounting from Brooklyn College. A father of three who enjoys spending time with his kids, he also coaches youth baseball and is an avid bowler. In the summer of 1999, Edwin began his career with InterExchange as a member of the Camp USA program team where he helped with a variety of tasks, including data entry and welcoming newly arriving participants at the airport. After a brief break in the year 2000, Edwin returned to InterExchange in 2001 as the program assistant for Au Pair USA and has been with the company since. He moved from the InterExchange Au Pair USA program in 2010 to become the office services manager. Edwin previously lived in the Dominican Republic and Puerto Rico and has now lived in New York City for more than 20 years. He enjoys outdoor activities like softball, football, and tennis, among other sports.